Peter Rejcek, Antarctic Sun Editor: Penguins from outer space. Sounds like the title of some new B-movie science fiction film starring Vin Diesel. But polar researchers are increasingly using high-resolution imagery shot from orbiting satellites to find, count and assess the population health of penguin and seal colonies around the Antarctic. "The satellite imagery is the most important advancement in my field since satellite tagging. I think it's an absolute game-changer," said Heather Lynch, an assistant professor at Stony Brook University involved in a long-term census survey of brushtail and crested penguins around the Antarctic Peninsula. "Suddenly, we know what we don't know," Lynch explained. "We can look through the imagery and find colonies that we never knew existed, and look at population changes at colonies that were either inaccessible because of their location or they were impossible to census because of their size." Lynch is an active user and advisory member of the Polar Geospatial Center (PGC), based at the University of Minnesota. PGC has access, through the National Geospatial-Intelligence Agency, to commercial satellite imagery with half-meter resolution -- about the breadth of a man's shoulders. The National Science Foundation-funded center provides high-resolution imagery and maps for U.S. Antarctic Program research and operations. The main point of contact for all those users is Michelle LaRue, a research fellow at PGC whose interest in wildlife ecology has segued nicely with the remote sensing work. She has collaborated closely with Antarctic researchers involved in studying the polar region's most iconic animals, including Weddell seals and emperor penguins. "The counts are highly correlated, which basically means what we're seeing in the satellite images is representative of what's on the ground at the same general time," said LaRue, who is working on a PhD in conservation biology at the University of Minnesota. Robert Garrott, principal investigator for the MSU team, along with Jay Rotella, also a professor in MSU's Ecology Department, said the collaboration is beneficial to both sides. "We can ground truth and help refine Michelle's algorithms and her ability to actually count seals on the ice," he said. In turn, the satellite technology and associated methodology will help the project expand beyond Erebus Bay without chartering an expensive research vessel. "We can start asking questions about seal population and ecology over larger spatial scales without all the logistic support," Garrott said. Lynch is certainly a believer in the technology. She and colleagues have a paper in press with Polar Biology outlining their methodology to use satellites to survey colonies of Adelie, chinstrap and gentoo penguins around the Antarctic Peninsula. The latter species is thriving as the Antarctic Peninsula region warms, while the other two are in steep decline. The paper also includes work on a crested penguin known as a macaroni, with a prominent yellow crest that looks like long, wild eyebrows. A combination of extensive fieldwork and familiarity with each species' ecology helped with interpretation of the satellite pictures, according to Lynch, a co-principal investigator on the Antarctic Site Inventory program, which was started nearly 20 years ago by Ron Naveen, head of the nonprofit science and education organization Oceanites Inc.
"The remote sensing stuff is pretty incredible," Naveen said. "We're not quite putting our on-the-ground work out of business, which I'm happy about because I really enjoy doing it, but it's really an amazing supplement to what we've been up to for many years." The imagery is also a valuable tool to the group's fieldwork, which spans more than 140 locations around the Antarctic Peninsula. "We were able to find penguins that were not on maps previously," Lynch noted. "It's going to make the time we spend in the field much more efficient." Satellites have been around for more than 50 years, beginning with the launch of Sputnik I by the former Soviet Union in 1957. But it's probably only been within the last five years or so that pictures from space have been good enough for this sort of ecological research. In fact, one of the first papers published on the topic was in 2007 in Polar Biology, about estimating relative abundance of emperor penguin colonies in the Ross Sea. Paul Ponganis, a medical doctor and marine biologist at the University of California-San Diego's Scripps Institution of Oceanography, was a co-author on that paper, along with Gerald Kooyman, an emeritus professor at Scripps. Kooyman had gotten an exploratory grant from NSF in 2000 to test the feasibility of using satellite pictures to census emperor penguin colonies. Ponganis said there are still a number of hurdles to overcome before satellites replace the aerial surveys that he and colleagues have conducted at seven emperor penguin colonies around the Ross Sea for the last 20 years or so. For instance, it's still difficult to differentiate shadows from the black back of an emperor. Emperors stand vertically on the ice where they breed, not horizontally like a seal, which also causes some challenges. And the world's largest penguin also tends to congregate in tight huddles. Still, Ponganis is optimistic. "I think that will be the future -- the satellite," he said. Lynch agreed that there are still obstacles associated with the imagery, particularly around the Antarctic Peninsula, where clouds often obscure the region, making 90 percent of the imagery unusable. Weekly shots of Zavodovski Island in the South Sandwich Islands over a five-month period produced only one cloud-free scene. But she boldly predicts that in five to 10 years scientists will be able to monitor every penguin colony in the Antarctic, from a handful of birds to groups that are a million strong. "I think it's going to completely change the way we do penguin science in the Antarctic," she said. Indeed, the British Antarctic Survey (BAS) made headlines in 2009 when it announced researchers had used satellite images to detect the light brown stain of emperor penguin guano on the sea ice. 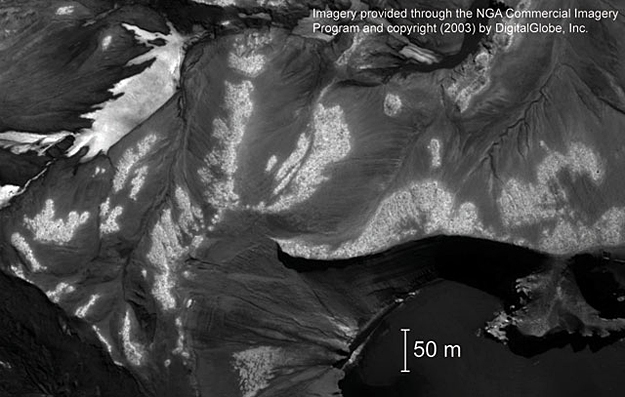 The imagery came from the Landsat Image Mosaic of Antarctica (LIMA), which seamlessly stitched together satellite photos of Antarctica acquired between 1999 and 2004. The BAS study found 38 colonies from the guano stains, four more than were thought to exist. Ten were new colonies, while six previously known colonies either had disappeared or could not be found. A half-dozen colonies had relocated more than 10 kilometers away from their last-known position. Such data are key to wildlife conservation issues, LaRue said. Currently, emperor penguins are a species of "least concern," according to the International Union for Conservation of Nature and Natural Resources (IUCN). But some scientists have argued environmental changes and human impact from activities like industrial fishing are causing problems. A paper in 2009 published in the journal Proceedings of the National Academy of Sciences predicted emperors could be on the brink of extinction by the end of the century. "There are lots of locations where there have never been counts, so the current estimate based on all of those sporadic, insufficient data is not that great," LaRue noted. "By being able to do this, we can actually see every single colony we know about and have a little bit better estimate of how many there are. You can't tell if they're going up and down if you don't know how many there are. "That's the conservation issue: We don't really know how many there are, so how can you say if they're doing fine or not?" she added. Such is the case of a chinstrap colony on Deception Island in the South Shetland Islands. A single satellite image from January 2003 compared to one from January 2010 shows dramatic changes are under way, according to Lynch. "You can see in the imagery how a penguin colony collapses," she said. "You look at those two images and there's absolutely no question that there's something serious, seriously wrong going on with the chinstraps. "It's concerning and scientifically exciting to be able to document those kinds of changes," Lynch added. "Moving forward, we'll be able to put together some amazing timelines." NSF-funded research in this article: Paul Morin, University of Minnesota, Award No. 1043681; Robert Garrott, Jay Rotella, and Donald Siniff, Montana State University, Award No. 0635739; William Fagan and Heather Lynch, University of Maryland College Park, Award No. 0739515; Ron Naveen, Oceanites Inc., Award No. 0739430; Paul Ponganis, University of California-San Diego Scripps Institution of Oceanography, Award No. 0944220.